Seaweed feeds and enriches plants and soil with a wide range of nutrients. Maxicrop is to be used as a supplement and will complement any fertilizer program used to make your plants healthy and strong. We recommend using seaweed extracts on plants that have irregular yellowed foliage that suggests a micronutrient deficiency. Applying a broad spectrum of essential micronutrients found in seaweed may be a fast, efficient remedy. Maxicrop Liquid Seaweed Plus Iron is ready to dilute in water, has a guaranteed analysis of 0-0-1 and is excellent for soaking seeds and bulbs, treating seedlings, cuttings, bare root trees and shrubs before and after transplant. 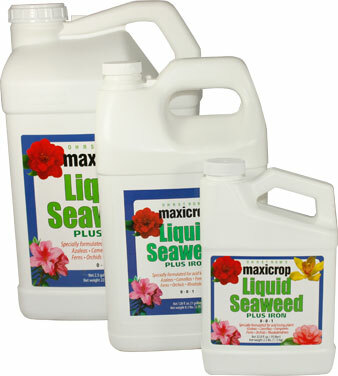 Maxicrop Liquid Seaweed Plus Iron can be used as a foliar feed, indoors or out, on a variety of acid loving plants and in hydroponic systems. Maxicrop Liquid Fish is made from fresh Menhaden fish and has a guaranteed analysis of 3-1-1. It is a fertilizer concentrate full of nutrients that can be used on all types of indoor and outdoor plants. The liquid is ready to dilute in water and has a guaranteed analysis of 0-0-1. 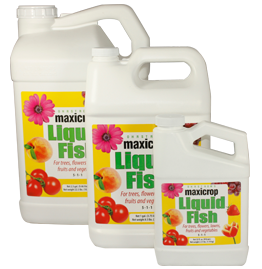 Maxicrop Liquid Fish can be used as a foliar feed, indoor and outdoor, or as a soil drench feed. Great for use on flowers, trees, lawns, fruits, vegetables, etc. 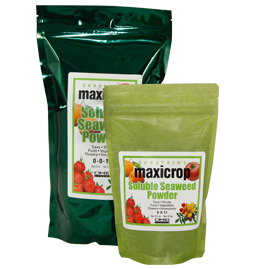 Maxicrop Soluble Seaweed Powder is a great choice for those who want to feed their plants naturally occurring minerals, vitamins, and enzymes. Maxicrop Soluble Seaweed Powder is extracted from Norwegian Ascophyllum nodosum seaweed. Maxicrop Soluble Seaweed Powder has a guaranteed analysis of 0-0-17 and is listed by the Organic Materials Review Institute (OMRI) for use in organic certified production. Great for use on flowers, shrubs, trees, berries, vegetables, fruit, root crops, etc. Maxicrop is used as a supplement to your fertilizer program. It will benefit your growing program from plant propagation to harvest. Maxicrop puts the precious costly nutrients inside the plant and into the available reserves in the soil. When mixed into the soil, it acts as a soil conditioner to help achieve a better soil constitution to aid in plant productivity. When used as a foliar feed, the seaweed is absorbed through the pores in the leaves and travels through the plant. Amounts are adjustable by need. Maxicrop 1-0-2 Kelp Meal is a Norwegian Kelp, one of the richest known sources of minerals, vitamins and amino acids. 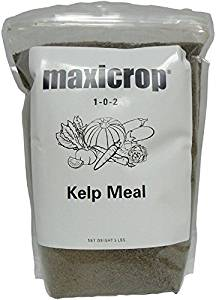 When used as a soil conditioner, Maxicrop Kelp Meal will improve deficiencies, thereby adding to the nutrition of vegetables from your garden. Our Kelp Meal is listed by the Organic Materials Review Institute (OMRI) for use as a fertilizer and soil amendment in organic production. It can also be incorporated into potting soils, seed and transplant beds, as well as composting material to improve the health of all your outdoor or indoor plants. It will add organic matter to your soil and help it retain moisture. Maxicrop Kelp Meal can also be used as an animal feed supplement as an economical way to provide a wide variety of amino acids, trace minerals and vitamins to improve overall health of animals. Maxicrop Kelp Meal is a Norwegian Kelp, one of the richest known sources of nutrients. Maxicrop Kelp Meal will improve many deficiencies, thereby adding to the nutrition of vegetables from your garden. It has been harvested, dried, processed with a patented process, then blended and ground. Can also be used as an animal feed supplement. ©Copyright 2018 Maxicrop USA, Inc.